In this captivating new memoir, award-winning writer Jessica B. Harris recalls a lost era—the vibrant New York City of her youth, where her social circle included Maya Angelou, James Baldwin, and other members of the Black intelligentsia. In the Technicolor glow of the early seventies, Jessica B. Harris debated, celebrated, and danced her way from the jazz clubs of the Manhattan's West Side to the restaurants of the Village, living out her buoyant youth alongside the great minds of the day—luminaries like Maya Angelou, James Baldwin, and Toni Morrison. My Soul Looks Back is her paean to that fascinating social circle and the depth of their shared commitment to activism, intellectual engagement, and each other. Harris paints evocative portraits of her illustrious friends: Baldwin as he read aloud an early draft of If Beale Street Could Talk, Angelou cooking in her California kitchen, and Morrison relaxing at Baldwin’s house in Provence. Harris describes her role as theater critic for the New York Amsterdam News and editor at then burgeoning Essence magazine; star-studded parties in the South of France; drinks at Mikell’s, a hip West Side club; and the simple joy these extraordinary people took in each other’s company. The book is framed by Harris’s relationship with Sam Floyd, a fellow professor at Queens College, who introduced her to Baldwin. More than a memoir of friendship and first love My Soul Looks Back is a carefully crafted, intimately understood homage to a bygone era and the people that made it so remarkable. "[N]ever, to this reader, uninteresting ... “My Soul Looks Back” has a simmering warmth." "Harris intimately reflects on her friendships with these fascinating individuals and their social circle, capturing an era that was vibrant with creativity, art, activism, and intellectual life." "My Soul Looks Back is a great New York City memoir; I thought of James Wolcott’s Lucking Out and Patti Smith’s Just Kids, both documents of the city in the seventies, as well as books from an earlier New York, like Anatole Broyard’s Kafka Was the Rage and Mary Cantwell’s Manhattan, When I Was Young ... I finished the book eager to find a noisy neighborhood restaurant where the wine is served in mismatched glasses and the specials are under twenty dollars." "[Harris] is a born storyteller and her memoir is a joy to read—a beautiful portrait of a remarkable era." "A friend of celebrated authors Maya Angelou and James Baldwin, Harris was part of a fascinating social circle in the early ’70s. She shares a unique look at their lives and work, while also opening up about her own career and relationship with one of Baldwin’s colleagues. As a bonus, each chapter has a related recipe." "This is a lively, entertaining, and informative recounting of a time and place that shaped and greatly enriched American culture." 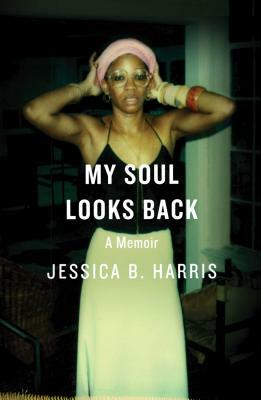 "Scenic and engaging, My Soul Looks Back recounts the years author Jessica B. Harris spent on the periphery of a circle of friends that included literary powerhouses James Baldwin, Maya Angelou, and Toni Morrison. The memoir spans the globe and several decades to describe the fascinating group." "Come for the insight into the circle of friends that first resolved around James Baldwin, then shifted orbit to revolve around Maya Angelou. Stay because you're enraptured by the candid, passionate woman narrating from the periphery. This is an intimate look at an inner circle of Black writers, scholars, and glamazons moving through the middle of the twentieth century and into the twenty-first, told with bold tenderness by a woman who grew up in their company, under their gaze." "At table, before a lectern, or on the page, no matter where we encounter Jessica B. Harris, she commands our attention. My Soul Looks Back, her most intimate book, showcases an era when the Black artistic elite flowered and Jessica, along with her love Sam Floyd, lunched with Maya Angelou in California, shared popcorn with James Baldwin in the South of France, and nurtured a social aesthetic that spangled, all too briefly, beneath the kliegs." "In My Soul Looks Back, Jessica Harris uses her amazing griot voice and exquisite writing skills to take the reader with her on a serendipitous journey filled with everything from a sampling of her unique culinary creations to up-close-and-personal looks at some of the world's most renowned arists—from James Baldwin, aka Jimmy, to the inner circle she was allowed into by her mysterious lover, Sam. A tour de force that holds its own among the great memoirs of all time." "Jessica Harris takes you on a magical journey through the streets of New York, through a distinctive and historical era." "I devoured Jessica B. Harris's My Soul Looks Back as though it were one of the feasts she describes in its pages—brimming with food, wine, wit, and wisdom. This luminouus and illuminating memoir is also a song of love and praise to the heyday of bohemian, intellectual New York, and especially to the African American arts and literature community that has supplied the city with so much of its brilliance and vibrancy." "Harris's culinary expertise winds through her stories, and each chapter ends with a recipe, including her mother's Sunday roast chicken and Goujonnettes de Sole with Ersatz Sauce Gribiche, inspired by her favorite after-opera meal. No doubt a few of Harris's friends have been saying for years that she had to write this memoir, and if so, they were right."